Cao Dai (Cao Đài) is an Asian new religious movement that emerged in Vietnam in 1926 and was founded by Ngô Văn Chiêu (1878 – 1932). Caodaiists, as followers of this religion are called, believe that humanity is currently in the final age of revelation and salvation, and that their religion provides God's latest plans. Cao Dai is syncretistic, embracing insights from other religious traditions, especially Taoism and Buddhism. Adherents engage in eclectic practices such as prayer, veneration of ancestors, nonviolence, séances, and vegetarianism with the goal of rejoining with God the Father in Heaven, and the ultimate goal of freedom from reincarnation. Estimates of the number of Cao Đài adherents in Vietnam vary, but most sources indicate their numbers at two to three million, although some estimates are as high as eight million adherents. There are an additional 30,000 in the United States, Europe, and Australia. The term Cao Đài is an abbreviation of the Vietnamese name for God in this movement, whose full title is Cao Đài Tiên Ông Đại Bồ Tát Ma-ha-tát (meaning "Venerable One of Low Rank," signifying the humbleness of God). Paradoxically, the term Cao Đài literally means "high tower," which symbolically refers to heaven, where God reigns. The full name of the religion is Đại Đạo Tam Kỳ Phổ Độ (Great Religion [of the] Third Period [of] Revelation [and] Salvation). Cao Dai's was founded by Ngô Văn Chiêu (1878 – 1932), a Vietnamese man working for French colonialists. Ngô Văn Chiêu was well versed in both Western and Eastern spiritual traditions, and in 1919 began participating in séances with colleagues. Thereafter, Ngô Văn Chiêu and his colleagues claimed to have received direct communications from an entity they called Cao Dai, who gave them explicit instructions for establishing a new religion that would commence the Third Era of Religious Amnesty. Cao Dai grew rapidly in the decade following its establishment as a church in 1926. The movement was and remains especially popular in southern Vietnam. Leading up to the union of Vietnam in 1975, the Cao Dai Holy See was a powerful force in religion and politics in South Vietnam, controlling great amounts of property, claiming many adherents, and organizing its own military resistance. However, following union under the communist government, Cao Dai lost a great deal of its power, though retained its temples and many followers. 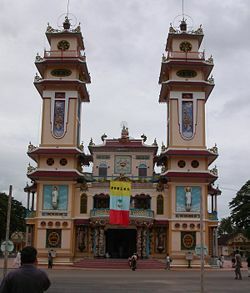 In modern Vietnam, Cao Dai has regained some of its autonomy and has been recognized as an official religion in Vietnam, as well as having spread into Vietnamese communities in Australia and North America. Cao Dai, being syncretic, holds beliefs common in other faith traditions such as: karma, reincarnation, the unity of God, the existence of the soul, missionary work, and ancestor veneration. Traditional Vietnamese cultural ideas and taboos are also incorporated into the belief structure of Cao Dai. According to Cai Dai, before God existed there was the Tao—the nameless, formless, unchanging, eternal source referenced in the Tao Te Ching. At some point, a cosmic event occurred, out of which God was born. The universe could not yet be formed because God controlled only Yang. Therefore, God shed a part of himself and created the Goddess, who is the master of Yin. In the presence of Yin and Yang, the universe materialized. The Goddess is, literally, the mother of the myriad of things in the universe. Thus, Caodaiists not only worship God, the father, but also revere the Goddess. The Goddess is master over Yin but is not a part of Yin, which is female. In some Cao Dai literature, the Goddess has been identified with the Mysterious Female of the Tao Te Ching. However, Caodaiists consider themselves strict monotheists. In the Cao Dai understanding of God, we see influences from Taoism, Buddhism, and Western monotheistic tradition. Caodaiists perform prayer and reverence to God. Prayer ceremonies are held in temples at 6 a.m., noon, 6 p.m., and midnight daily. Offerings of incense, tea, and food are made on the altar, just as is performed in traditional Chinese and Vietnamese Buddhism and Taoism. 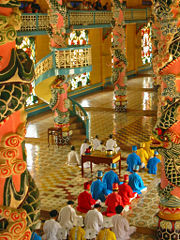 While men and women are viewed as equal in Cao Dai, men enter their temples from the right and women enter from the left. Chanting is also a standard Cao Dai practice and form of worship. Critical in the formation of Cao Dai were séances, whereby information about God was received. Séances in Cao Dai continue to offer a conduit for revelation in this religion, though regulated by the Tây Ninh Holy See. The manner in which séances are performed is not limited; at times, spirit writing using a brush or other implement is used. Alternatively, blank sheets of paper can be placed in an envelope and left above the altar until they are taken down and claimed to reveal new messages. Séances can be conducted in Vietnamese, Chinese, French, or English, depending on the spirit being contacted. Cao Dai recognizes the diversity of religious history in both the East and West, and moves to include them within their religion. The insights of Buddhism, Chinese religions, and the monotheistic Abrahamic faiths are acknowledged, though in a hierarchal manner. These movements are called the Three Teachings, known as the Teachings of the Buddhas, the Teachings of the Sages, and the Teachings of the Saints. The Three Teachings represent levels of spiritual attainment, with the Teachings of the Buddhas as the highest. In addition to Buddhas, Sages, and Saints, Cao Dai also recognizes Thần, for which there is no English translation but can be thought of as exceptional human beings similar to Buddhas, Sages, and Saints. Thần may have extremely long life in the realms of heaven, but only Buddhas are free from the cycle of birth and death. In recognizing the Three Teachings, Cao Dai also recognizes three periods of spiritual revelation from God. The first and most ancient period includes figures such as Laozi, Dipankara Buddha, and legendary Chinese sages. The second period includes Shakyamuni Buddha, Muhammad, Confucius, Jesus, and Moses. Caodaiists believe that though the truths revealed by these figures were received from God, they were limited to their geographical and historical context, and became distorted in time. The Cao Dai religion asserts that we are presently in the third age of revelation and salvation, with a direct link to God through the Cao Dai movement. Although various sects of Caodaiism claim to have received messages from numerous spiritual entities, the Tây Ninh Holy See acknowledges significantly fewer. Inside the Holy See is a painting depicting the Three Saints  signing a covenant between God and mankind. From left to right, they are: Sun Yat Sen (a Chinese revolutionary and leader), Victor Hugo (a French author and poet), and Nguyễn Bỉnh Khiêm (a Vietnamese poet). Additional famous Western figures are both honored and contacted through séance in Cao Dai, such as Joan of Arc, William Shakespeare, and Vladimir Lenin. God is symbolized by the Divine Eye, specifically the left eye, because Yang is the left side and God is the master of Yang. The Divine Eye is widely displayed throughout Cao Dai temples and literature. This symbol was revealed to Ngô Văn Chiêu directly during a séance. The Tây Ninh Holy See has been the main source for orthodox Cao Dai scriptures since the establishment of the religion in 1926. Since 1927, the Tây Ninh Holy See has been the sole source for Cao Dai scripture. Most official religious documents were delivered to the leaders of Cao Dai through séances between 1925 and 1929. Other Cao Dai groups that have moved away from the Tây Ninh Holy See have developed their own scriptures, sometimes in opposition to orthodox works. Scriptures were written in Vietnamese. The Thánh Ngôn Hiệp Tuyển (Compilation of Divine Messages) is a work that collects together important messages received by Cao Dai leaders through séance. Another important work in Cao Dai is the Religious Constitution of Caodaiism (Pháp Chánh Truyền), which delineates religious organizational structure. Before the reunion of North and South Vietnam in 1975, Caodaiism's governing body at its inception consisted of three branches that were functionally equivalent to the United States' legislative, executive and judicial branches of government; however, following the end of the Vietnam War, the communist government outlawed these bodies and attempted to administer the Cao Dai indirectly. The head of Cao Dai is called "Giáo Tông," which means "leader" of a philosophical or religious organization. The hierarchy of Caodaism's dignitaries and those of the Roman Catholic Church is very similar and has led translators to borrow terminologies such as pope, cardinals, bishops, and priests. In practice, Caodaiism has more ranks and titles than the Roman Catholic Church. The first Giáo Tông of Cao Dai was Le Van Trung, one of the original mediums, who, it is believed, was chosen by God in 1926. Despite their ecclesiastical hierarchy, Caodaiism stresses equality among men and women. However, ordained women may attain ranks only up to cardinal but not pope. This point may be interpreted as not reflecting the principle of equality. According to Cao Dai, this apparent discrepancy can be explained by God's alleged primordial nature, which is Yang (represents male). They believe that Yin (female) cannot rule over Yang or else chaos would ensue. 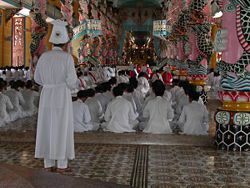 Like other religions, within Cao Dai there are several movements that grew in opposition to the originating religion. Most of these developments find their basis in séances where new information was received by Caodaiists, but not acknowledged by the Tây Ninh Holy See. Within these respective movements, new revelations make up the textual canon. These movements do not claim as large a membership as the orthodox Cao Dai religion. This page was last modified on 9 January 2017, at 16:38.